Anybody with a more than passing interest in Malayalam cinema will tell you that Chemmeen was the first film in the language to win the President’s gold medal and that it happened in 1965. But how many people are aware that in that very year, another Malayalam film had won the silver medal as well? 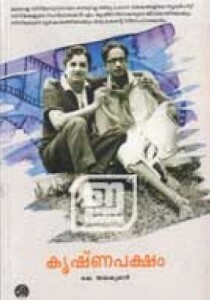 The film in question is Kavyamela, a touching story in black and white about a blind poet (Prem Nazir) whose masterpiece work (from the name of which the movie draws its title) is stolen by a wastrel (Adoor Bhasi) and the poet’s love for a rich woman (Sheela) who adores him. The film was written by S.L. Puram Sadanandan and directed by M. Krishnan Nair. A book on the latter personality, titled Krishnapaksham, is the subject of this review. The author is his son K. Jayakumar. K. Jayakumar who recently retired from the Indian Administrative Service was the busiest bureaucrat in the state. The record he built for himself as an honest, upright and hardworking officer made him the government’s go-to person for everything from mediating the Mullaperiyar dam issue to managing Sabarimala. He had held many key posts including the first Registrar of the nascent MG University, Kozhikode Collector, Culture Secretary, etc leading to his ascension to the top job at the Secretariat early this year. Post retirement he has been made Vice Chancellor of the newly formed Malayalam University. However his personality has never been stunted by the rigors of official grind. He is a man of the muses and keeps himself recharged with cultural pursuits in his spare time. That is when the poet, lyricist, scenarist, story-writer and painter in him take wings. Hailing from Keraladityapuram in Thiruvananthapuram, Jayakumar did his schooling at St. Joseph’s High School and degree from Mar Ivanous College where thespian Jagathy Sreekumar and the late minister T.M. Jacob were his peers. He has translated Tagore, Rumi and Gibran and written five volumes of poetry besides more than a dozen books of stories for adults and children. 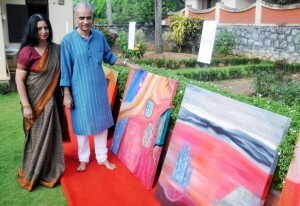 He has also held exhibitions of his paintings. He has penned lyrics for 80 movies, the prominent among them being Kudajadriyil Kudikollum (unreleased movie Neelakkadamp), Chandanalepa Sugandham (Oru Vadakkan Veeragatha), Sooryamsuvoro Vayalpoovilum (Pakshe), Saarangi Maarrilaniyum (Pavakooth) and Souparnikamritha Veechikal Padum (Kizhakkunarum Pakshi). Krishnapaksham is a slim book of memoirs, under 100 pages. It is a touching but objective account of a son about his father – looked at from both personal and professional angles. One is reminded of the poignant essay Shashi Tharoor wrote about his father the eminent newspaper manager Chandran Tharoor and which is included in his book ‘The Elephant, The Cell phone and The Tiger’. It is a coincidence that both these writers are also proud sons of Thiruvananthapuram today. M. Krishan Nair (not to be confused with the literary critic and writer of the acclaimed Sahityavaaraphalam column) was a man who thought big and lived simple. Passionate about cinema from a young age, he once watched The Great Train Robbery in his village theatre on many days continuously that the cinema hall owner decided to let him in for free. Despite growing on to become a filmmaker who directed nearly 100 movies including many jubilee hits in Malayalam, Tamil and Telugu, he eschewed the trappings of glamour and preferred to live in a simple Udipi lodge in Mylapore in Madras for a quarter century. He stuck to the Hamletian policy of ‘neither a borrower nor lender be’. He had no time for prudes and vanity. While in school, Jayakumar once read a scathing attack on his father’s film Bharthav in the journal Kaumudi by its founder-journalist K. Balakrishnan. Hurt and insulted by this he tended to see Balakrishnan’s sons who studied in the same school as enemies. The patch-up happened only when the same reviewer later praised Krishnan Nair’s Kaattuthulasi to the skies! Bathing scenes (of heroines, make no mistake) were staple in Nair’s films. A friend in college took particular interest in teasing the son on this note. Jagathy also raised a few laughs with his witty comments. When Thaalappoli was released, the man who was to define comedy in later years joked, ‘There seems to be a spelling mistake in the credits. Shouldn’t the name have been ‘Thallippolli’! ?’ But the fame of Nair continued to grow. Jayakumar imbibed early lessons about how recognition is good and also more importantly that any big star off-screen is just like you and me. Perhaps that could be why, he muses, he never wanted to be a movie star himself. Even if the father willed that the sons do not venture into films where lives burnt out like moths in flames, somehow or the other they did get connected. The youngest son worked along with Hariharan (who made many hits with MT), the long-time assistant of Nair who later branched out. The middle one ran a theatre and later became a producer. He produced Mammooty-starrer Oru Abhibhashakante Case Diary which K. Madhu directed. The eldest son Jayakumar found his calling in writing, lyrics to be precise. He debuted in his father’s Bhadradeepam when a mere 19 years old. The song was Mandharamanamulla Kaate. It was set to music by Baburajan, sung by Yesudas and enacted by Nazir. One of the advises his father gave him and which he says has stood him in good stead so far, was to steer clear of the many temptations that the field offers. Many are the hits that flowed from the talent bank of M.Krishnan Nair. Apart from Kavyamela there were Sthanarthi Saramma, Agniputri, Karthika, Bharyamar Sookshikkuka, Padunna Puzha, Vivahitha, Kuttikkuppayam, Collector Malathi, Jwala, Pinchu Hridayam and many others. The association between him and Prem Nazir was huge and deep-rooted. It went beyond the filmi bhaichara. In fact the front cover of this memoirs show Nair and Nazir sitting hands on each others’ shoulders and enjoying a smoke. 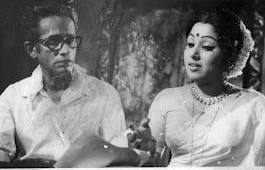 When Nair called cut to a scene midway as MGR was acting (for Annamitta Kai, along with Jayalalithaa) it was a first for Kodambakkam. No director had dared to do this before, cutting MGR mid-shot but the star-politician appreciated it. This yen for perfection is also why technicians like cinematographers, editors and sound engineers held this director in high esteem. Nair incidentally provided one of the biggest hits for MGR, Rickshawkaran. The actor went on to win the National Award for this title role. Most of the songs in Krishnan Nair’s movies were set to music by Dakshinamurthi, Baburajan, Devarajan and M.S. Viswanathan. Some of the immortal gems of Malayalam cinema music like Panchavarna Thatha Pole, Manjalayil Mungi Thorthi, Kannu Thurakkatha Daivangale, Pavada Prayathil Ninne Njaan, Hridaya Sarassile Pranaya Pushpame, Swapnangal Swapnangal were heard in M. Krishnan Nair movies. Awed by the Himalayan genius of Vayalar, Nair was ever his fan. That way young Jayakumar got to read many lyrics that Vayalar wrote for other film makers, even before those were incorporated into the films. Some examples are Ezhu Niramulla Ther, Ujjayiniyile Nayika, etc. The only picture that adorned Nair’s bedroom apart from his mother’s was Vayalar’s. His favourite Kerala town was Kozhikode. One added reason for his frequenting that hotbed of Malayalam literature was meeting the great composer Baburajan. Like Hariharan and K. Madhu in Malayalam, Nair had a Tamil disciple who went on to really distinguish himself, the balladeer of the village drama, Bharatiraja. Because of Nair’s prolonged absences from home, the family, especially the elder son Jayakumar came to handle extra responsibilities. There were emotional worries that the mother coped with. Even if Nair had a clean image, as in any age then also there was no shortage of rumors linking him to co-workers. Jayakumar is witness to his mom shedding silent tears in this regard. He hastens to add the rejoinder that he is no man to analyze his father as a husband. Nair had a pronounced weakness for alcohol. His last film was Kalam Maarri Katha Maarri (1987). A chapter is devoted to how mentally and spiritually the film maker started preparing for his own death from the age of 69. It came five years later, in the year 2001. Before his passing away the government bestowed the J.C. Daniel Award to him for his contribution to cinema. He received it from the Chief Minister E.K. Nayanar. He was helped on to the stage by K. Madhu. The mural of Lord Padmanabha that Jayakumar stores in his puja room is a cherished gift from the father to the son. As we read Krishnapaksham we respectfully remember that great lover of cinema and the wonderful legacy he has bequeathed us. This entry was posted in Art, Books and Literature, Culture, Film, Leisure and Recreation, Life, Literary, Music and tagged chemmeen, Jagathy Sreekumar, K Jayakumar, Kavyamela, Krishnapaksham, M. Krishnan Nair, S.L Puram, Thiruvananthapuram, Trivandrum. Bookmark the permalink.